To stay at the top of their respective markets, organizations must be able to continually feed more data into their evolving business models without sacrificing performance and letting costs get out of control. One U.S.-based investment firm found itself in a similar predicament, struggling to store 100 petabytes of data—both for archiving and for high-speed quantitative processing—while easily scaling their systems to account for data growth. 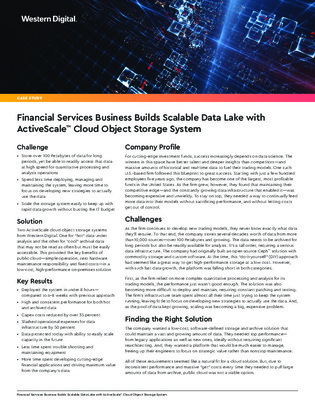 Keep reading to discover how implementing cloud object storage impacted these challenges, and to see how the firm resolved their “hot” and “cool” data access issues.